The new FC Barcelona kit is finally here. 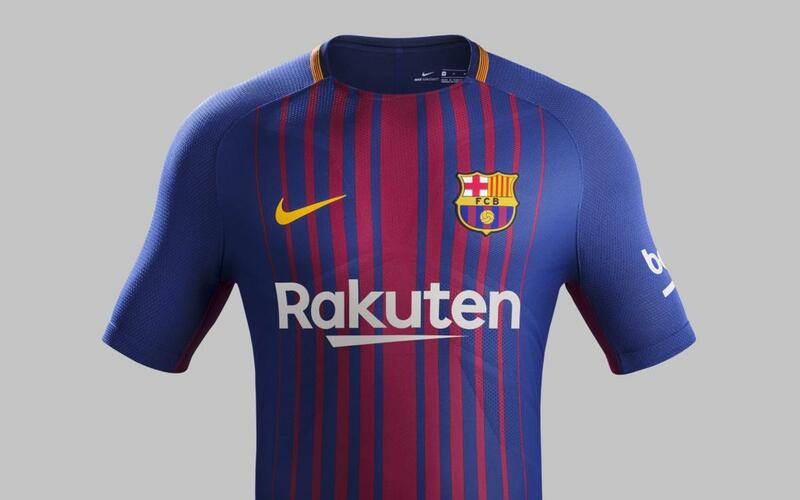 For the first time the shirt will bear the name of Japanese company Rakuten, the Club’s new global sponsor from 1 July. The kit will be available from 1 June at Nike.com/FCB and in the Club’s official shops and distributors. The new FC Barcelona’s Nike Vapor home kit is an updated interpretation of the traditional Blaugrana, defined by a progressive combination of the traditional stripes with revolutionary Aeroswift technology, to produce cutting edge performance apparel, replete with modern detailing. On the torso, the traditional Blaugrana is updated and defined by red attenuating vertical stripes against a deep royal blue background. Detailing inspired by the club’s history and culture can be seen on the neck collar, which is partially defined by the Catalan flag, the Senyera. The shirt’s engineered knit zones create a subtle geometric pattern that enhances fit for the athlete in motion. A darker red stripe begins at the inside of sleeve and the jersey, and expands when the player is in motion, to maximize ventilation. The classic FC Barcelona blue shorts also feature this darker red stripe to provide greater ventilation. Completing the kit, blue socks infused with Nike Grip technology, feature “Barça” on the front in contrasting gold, whilst a distinctive red linear graphic runs down the back of the calf.